I don’t know where the year has gone, but it is time for Glamour Splash 2013 — and I’m so excited I can hardly stand it. We’re celebrating all the soon-to-be High School Seniors, and doing something VERY special for our community. AND — all proceeds go to Cinco Charities to help build and operate the Ballard House, a temporary overnight housing facility for families that travel to the Katy/West Houston area for medical care. Ready to take the plunge? Reserve your session HERE! and then keep reading for more details. Glamour Splash started last year, benefited a local food bank, and it was FABULOUS… but, between you and me, our timing was a little bit off. We waited too late into the summer, and quite a few of our potential participants were already out of town, so this year we’re not even waiting for the last day of school. In the Katy schools, students get to exempt a number of their final exams based upon what grade they are in, their attendance, and academic performance — so we’re celebrating their achievements and playing HOLLYWOOD while their younger siblings are sitting in finals. na na na na boo boo! 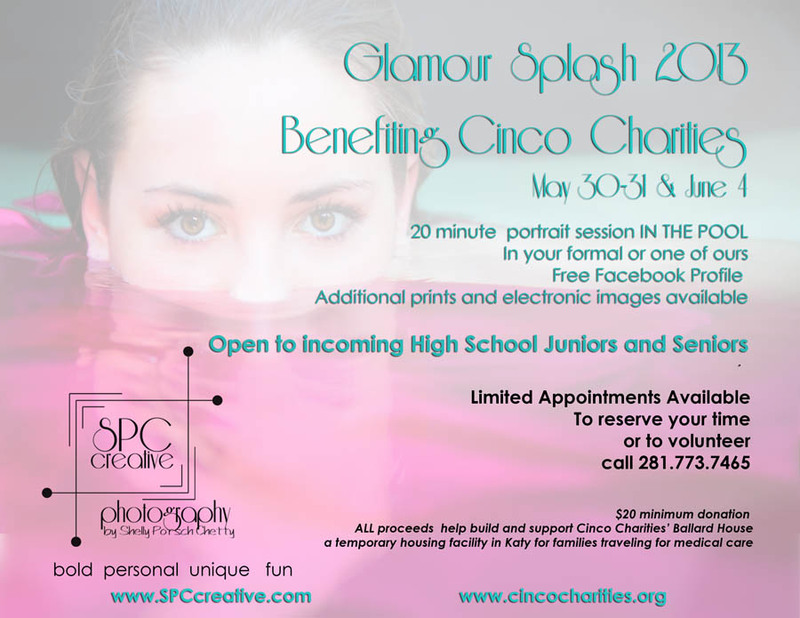 Glamour splash is open to any girl who has shot her senior portraits with our studio, regardless of the year, as well as to anyone in the class of 2014 or 2015. The sessions will last 20 minutes each, and you can use your own formal dress or choose from one of ours. To register, go to http://SPCcreative.bookmonline.com . A minimum donation of $20.00 will reserve your session, and you’ll get a free Facebook/social media profile picture. Additional options are available to increase your contribution to Cinco Charities — and they come with extra goodies. After the session prints and electronic files will be available online — still benefiting Cinco Charities. Session reservations are non-refundable, but every single penny goes to this great cause. 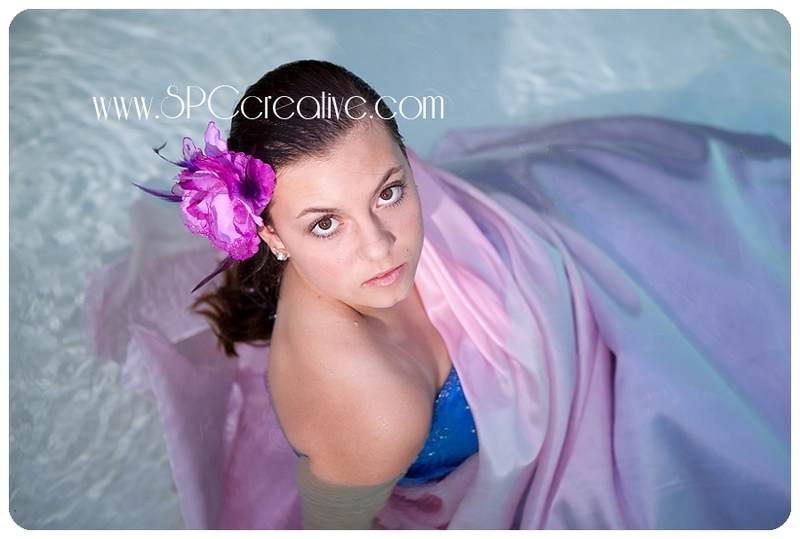 We highly recommend that you bring your own dress for the session because that will make your session totally personal, but we also understand if you don’t want to take the risk of putting your pretties into a chlorinated swimming pool. We have a few dresses in the studio that you can choose from — or you can wear your own bandeau-style swim top or tube top, and we’ll use fabric drapes to create your special images. We are also accepting dress donations for future Glamour Splash events! Should you use your own dress, please bear in mind that you are doing so at your own risk. Most synthetic fibers are perfectly safe in the water as are quite a few natural fibers, but I am NOT Heloise and I will not make any promises. — What I WILL promise is that you’ll get a ROCKIN photo session. We’ll have fun, and you’ll have the coolest summer photos around. And to add a little more of your personality to some of your images, you’re encouraged to bring your own hair decorations and anything that will float — EXCEPT GLITTER. We don’t need glitter in our filter. Flowers and petals would be lovely though. If you have other cool ideas we’re ready to hear them! No release? No shoot for you. So sorry but it’s super important. After all… we’re all in this to do GOOD things. SO — click here to reserve your spot or to volunteer. Volunteer? Did you say volunteer? YEP! We have a few spots for gals looking to add a few hours to their community service log or to just gain some behind the scenes experience at a fashion photo shoot. You’ll be serving as a hostess, helping other girls get ready for their session or acting as a photographer’s assistant, helping adjust dresses and fabrics, moving and holding lights and shade cloths. Call the studio at 281.773.7465 during business hours if you’d like to help out. Ready to take the plunge? Reserve your session HERE!